Chalkboards and dry erase boards are a perfect promotional tool because each is easily modified to say what your business wants at any given time. Custom Pool Table Lamps powered by The MRL Group offers a wide range of chalkboards. Our chalkboards can be made into wall signs, A-frame or sidewalk displays. Using a chalkboard A-Frame or sidewalk sign, quickly and efficiently promotes your business. All of the chalkboards can be fitted with either wood, metal or plastic. We can custom build your chalkboard to be illuminated with LED lights or include a digital clock, perfect for dark venues such as bars, restaurants, or night clubs. The chalkboards we produce can be customized to meet any shape and size, and printed in any color. Trust in Custom Pool Table Lamps powered by The MRL Group to create a chalkboard that is one of kind and meets any budget. Clocks can be found at practically any business, which is why they make such great tools for marketing. Custom Pool Table Lamps powered by The MRL Group creates clocks to meet any business need. We can make a neon clock that will look great at a bar or we can create a beautiful wood clock for a more traditional look. You can choose a clock that is in stock or custom order a clock to perfectly fit your business and brand. Clocks can be made out of wood, metal or acrylic, which can either be digital clocks or analog clocks. Illuminated and neon clocks are a great option if you’re looking for something more vibrant. Clocks can also be customized to any shape such as surfboards, barrel heads or bottle shaped. 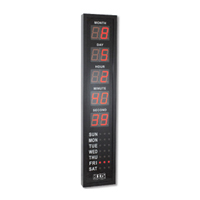 Clocks are a very versatile and inexpensive promotional tool. Call Custom Pool Table Lamps powered by The MRL Group today to order a custom clock that will help your company get noticed. Custom Pool Table Lamps powered by The MRL Group specializes in providing the most distinct and high quality mirrors on the market. All of our mirrors can be custom tailored to any style, shape, design or size. Our mirrors can be framed with metal, wood, or vacuum formed plastic. All of the mirrors we offer can be illuminated and specialty printed using various decorating techniques. Custom Pool Table Lamps powered by The MRL Group strives to provide our clients with the best point of purchase mirrors, which will meet and exceed any of their expectations. Contact us today! An attractive and creative custom tap handle is a great way to make your company stand out against the many other beer companies behind the bar. Enhancing your brand’s visibility with a custom tap handle will undoubtedly create brand awareness, resulting in increased revenue. Custom Pool Table Lamps powered by The MRL Group is a leader in creating custom tap handles that meet any specification. Tap handles can be made of resin, wood, acrylic, ceramic, polyurethane, or epoxy. Custom Pool Table Lamps powered by The MRL Group can custom design a tap handle in any shape, size, design, or color. 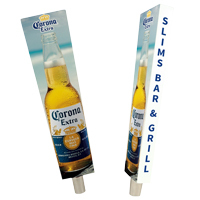 Contact us today to order your custom tap handle.